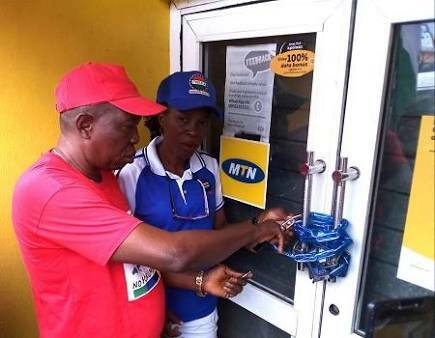 MTN Office Picketing By NLC Violated Global ILO Rule? Now, it has emerged that the destruction of MTN assets, violence and threats violate an important section of the International Labour Organization (ILO) ethics of which the NLC is a member. According to Vanguard, under the ILO Principles concerning the right to strike, section 8.1 which focuses on picketing clearly states: Taking part in picketing and firmly but peacefully inciting other workers to keep away from their workplace cannot be considered unlawful. The case is different, however, when picketing is accompanied by violence or coercion of non-strikers in an attempt to interfere with their freedom to work; such acts constitute criminal offences in many countries. Following this outright display of violence and disregard for the ILO code of conduct, several respectable Nigerians have come out to condemn the NLC. Notable among these are renowned UK based accountant and social commentator, Feyi Fawehinmi and veteran radio presenter, Jimi Disu who during his radio session, called the act by the NCC a fund-raising exercise. In his words: “As far as I am concerned, they went on a fund-raising exercise. The Nigerian Communications Commission (NCC) as well as the Association of Licensed Telecommunications Operators of Nigeria (ALTON) have openly condemned these acts of violence, and the ALTON went as far as saying it will advise MTN Nigeria to consider preventive shutdown of network if telecoms facilities are damaged.